You can’t think about Thanksgiving without thinking about cranberry sauce. Whether you choose to buy the canned version or make your own, this delicious sauce will most likely find its way to your table. 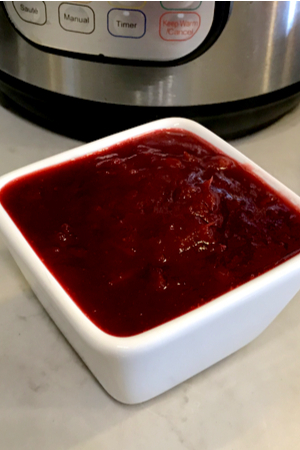 Instant Pot Cranberry Sauce – cooked and ready to be chilled overnight. When I was growing up, my parents would always buy a can of cranberry sauce. They would open the can and it would slide out in the complete shape of the can – ridges and all! They would lay it on its side and make whole slices and serve it along side of the turkey. As a young child, the looks of it alone steered me away from ever trying a single bite. In my mind, anything that looked like Jell-O should taste like Jello-O. And canned cranberry sauce certainly did not! In fact, it wasn’t until my college years that I discovered fresh cranberry sauce. Be sure to zest your orange before juicing it! I prefer to use a microplaner because the zest is in tiny pieces. I went home with a friend the weekend before Thanksgiving. She had to go to an early family Thanksgiving celebration and didn’t want to travel alone. When we arrived at dinner, everything looked like a typical Thanksgiving meal. Everyone was gathered in kitchen finishing up the last touches on their recipes. The table was set in the finest silverware and linens and their were young children playing together in the living room. That is when I discovered that you could actually make your own cranberry sauce! Not to mention, the fresh cranberries were used for Cranberry Baked Brie and I didn’t even know it. 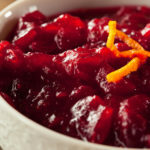 Although canned cranberry sauce gives you all of the basic flavors of sweetened cranberries, the cans are sometimes filled with High Fructose Corn Syrup in addition to sugar. 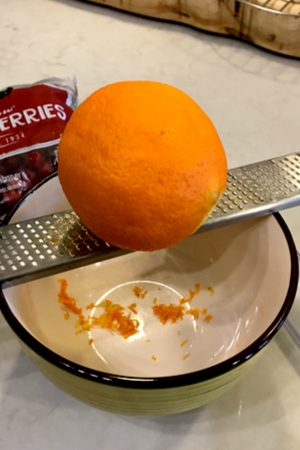 If you don’t have a juicer, or don’t want to dirty another dish, use tongs to squeeze the orange. It is easy to make your own cranberry sauce using fresh berries. Plus, you control what goes into your recipe! Of course, there is sugar in the recipe. Cranberries alone are extremely tart and need to be sweetened for a pleasant taste. However you can choose to use sugar substitutes or natural sugars such as orange juice, maple syrup and honey. 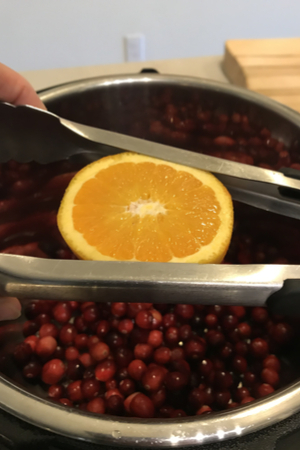 You can also choose to add additional flavors to add a little depth to your cranberry sauce. We almost always use orange juice, but you could use pineapple juice and crushed pineapple as well. Add in a little cinnamon and you have a flavor that everyone loves! I decided to use my 6 quart Duo Instant Pot to make my cranberry sauce the night before Thanksgiving. The house was crowded with guests, pizza was ordered and everyone wanted to play a board game. I knew that I had to get the sauce made so that it had plenty of time to chill overnight. I used my typical cranberry sauce recipe and threw everything in the Instant Pot. So instead of standing over the stove for 20 minutes stirring a pot, waiting for the cranberries to pop, I decided to make Instant Pot Cranberry Sauce. Knowing that the cranberries would heat up both during the building pressure phase and during natural pressure release, I figured it wouldn’t need much actual cooking time. I threw in the ingredients of my traditional cranberry sauce recipe and set the pressure cook time to 2 minutes. Off to the family room I went to spend time with the family! Once the pot had enough time to release the pressure, I had to decide if I wanted to crush or puree the cranberries any further. You can use your immersion blender to puree to the desired consistency. The Instant Pot broke down the cranberries nicely, but I knew there were a few picky eaters in the crowd that may not like the texture of a chunky cranberry sauce. I pulled out my immersion blender and gave it just a few whirls around the larger berries. I still wanted to have some texture but not be filled whole berries. It literally took me 15 seconds to have it broken down to the perfect consistency. I thickened the sauce for a couple of minutes on the Saute mode, and it was ready to be chilled! Classic homemade cranberry sauce that is made easy in the Instant Pot and ready to be served with our Thanksgiving meal. In a colander, rinse the cranberries and discarding any soft or damaged berries. 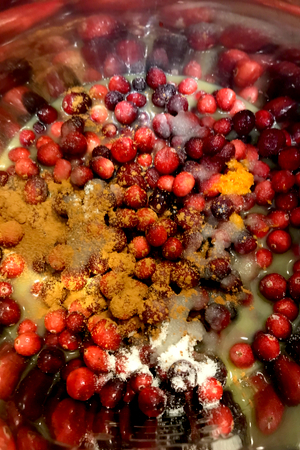 Drain and add the cranberries to the liner of the Instant Pot. Zest the oranges and then juice them until you get 1/2 cup of juice. Add the orange zest, orange juice, sugar, maple syrup, vanilla extract, and cinnamon to the pot with the cranberries. Gently stir to combine the ingredients. Lock the Instant Pot lid in place and set the vent to sealing position. Pressure cook/Manual on High Pressure for 2 minutes. Natural Pressure Release for 10 minutes then quick release any remaining pressure. 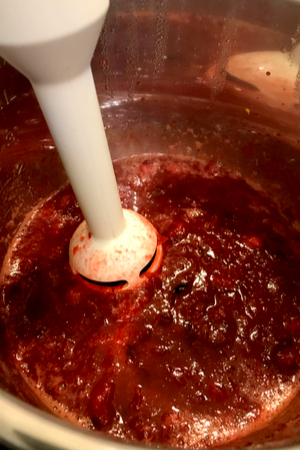 Use an immersion blender to break up any large chunks of cranberries (optional). Hit Cancel and turn on sauté mode and cook, stirring frequently, until desired thickeness has been reached (approximately 3-4 minutes). As a reminder, it will also thicken as it cools. Transfer the cranberry sauce to a bowl and allow it to cool completely. Top with orange zest and refrigerate until ready to be served. I usually make my own cranberry sauce; however, this is the first recipe I’ve seen for Instant Pot Cranberry Sauce. Yep, I’m gonna try it.